While the survey was essentially designed for travel agents its findings can be related to us all. What is clearly apparent is that unlike aircraft bookings, where the choice is relatively simple, with cruising it is a far more complex business and potential holidaymakers require guidance and understanding. The survey shows that 8% of UK adults report that that they may book a cruise holiday in the next 12 months. The Caribbean is at the top of the list of dream destinations. Asked where they would most like to go on a cruise holiday from a given list, if money were no object, just over a fifth (21%) chose the Caribbean; 15% the South Pacific and Australia; and 11% the Mediterranean. There are further indications that travellers could be tempted to swap their land-based holiday for one at sea. A third of people (32%) would be tempted to go on a cruise holiday if they were of lower or comparable cost to an all-inclusive holiday. The survey indicates a clear desire amongst UK adults to wake up in a new place almost every day, with 29% selecting this as something that would tempt them to choose a cruise. The problems of Costa Concordia in 2012 and sporadic yet well publicised outbreaks of norovirus, has had little impact on the majority of holidaymakers in the survey. Just over two-fifths (41%) of people who had not ruled out a cruise holiday beforehand said the media coverage did not put them off and they would still consider this a holiday option. Eight percent of all UK respondents said they weren’t aware of any media coverage of issues on cruise holidays. Price was a key issue. Four in 10 (40%) of people surveyed said that they perceive cruises are too expensive, and this puts them off a cruise holiday. Additional costs, such as drinks and tips for staff, were of concern to some. Nearly half of people (46%) think that a cruise holiday is most suited to older people aged 65+. However 29% believe that cruise holidays are most suited to couples without children; and just 6% think cruise holidays are most suited to a family with children. People are largely realistic when it comes to how much a cruise holiday costs: 29% of people would expect to pay more than £1,000 and up to £1,500 per person for a seven-night cruise to the Caribbean, whilst 38% think that a Mediterranean cruise costs more than £500 and up to £1,000. Taking out the air fare 4-star cruising is still available this summer for £75 per day inclusive. Rob Sinclair-Barnes, Director of Marketing for Amadeus UK and Ireland, said: “These findings should make for very pleasing reading for the UK’s travel agents and cruise providers, as they show there are enormous opportunities to sell cruises in 2013 and beyond". “However, there are still plenty of opportunities for cruise providers and sellers to communicate the various offerings more effectively: there’s still a perception that cruise holidays are for the older traveller, and that they’re expensive – despite sustained efforts by the industry to broaden its appeal to a younger clientele, where value for money is a key criteria". Amadeus is just about to launch ‘Cruise Shop’, which has been designed to help cruise sellers to communicate to clients about what is available and tailor the shopping experience based on the diverse needs of individual travellers. BTN will soon be trying it out. Last month BTN previewed Norwegian Cruise Lines’ Breakaway following its all too brief visit to Southampton on its way from Hamburg to New York, its home port. Now it is the turn of Princess Cruises' Royal Princess, named just a couple of weeks back by Her Royal Highness the Duchess of Cambridge. At 141,000 tons it is not quite the largest ship owned by Carnival Corporation (that honour is still with Queen Mary 2) but in terms of passenger numbers it is easily the winner with accommodation for 3,500 cruisers, plus lodgings (bunks and couches in the main) for up to 1,000 children. It is very difficult to compare Breakaway and Royal Princess although they are much the same size. 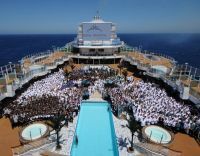 Both offer superb value in terms of what you get for the cruise price but Breakway offers for the most part seven-day holiday packages out of Manhattan, while Royal Princess is now on a series of 12-day Mediterranean cruises before crossing the Atlantic in early October for her winter home port of Ft Lauderdale. In terms of layout Royal Princess follows the successful blueprint set by Grand Princess back in 1998. There is still one annoying part of the layout (until you get used to it). Because the main kitchens are located on deck 6 between the Allegro restaurant in the stern, and Concerto and Symphony amidships, the journey from a pre-dinner cocktail in the huge atrium area, is tortuous. The trick is not to listen to the live music on deck 5, but take beverage on deck 7. Then stroll to the rear and down the stairs to Allegro. After your meal and if it is the theatre you require go up again to 7 and a walk the length of the ship to the massive show lounge. Allegro includes a special Chef’s Table Lumiere, a private dining experience that surrounds diners in a curtain of light. The same fare is served in Concerto and Symphony dining rooms where you can feast in the traditional style (two sittings) or ‘Anytime’. 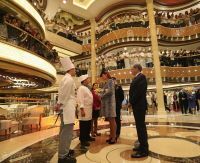 If the Southampton stopover is anything to go by the food and service on the new ship is at least equal, or maybe even better, than hitherto on Princess, a cruise line offering excellent cuisine. All the regulars are available including Sabatini’s, where passengers booked in suites can take breakfast. It is a superb Italian dining (chargeable) experience at night. We ought to add in at this point The Pastry Shop, said to be an industry first, with an amazing range of delicious looking cakes, all part of your deal. Speciality coffees are chargeable. Another new concept is the TV studio, complete with studio audience. Here is produced the ‘good morning’ show and the plan is to use it for passenger participation events. They can be filmed too. The popular Horizon Court buffet has been much improved and really is now a most congenial area, either for a coffee/snack (24 hours) or breakfast, lunch and dinner. Live stations serving regional fare will be a feature. A new ‘Crab Shack’ comes complete with crackers, bibs and buckets, and ‘Fondues’ serves a menu with three different cheese fondues: classic Swiss with white wine, German cheese fondue with beer, and a French cheese fondue with champagne. An afternoon on a ship is not much time to see all that is offered but Royal Princess is clearly a quantum leap forward with, for instance, ‘Movies Under the Stars’ not just an afterthought but part of the ship’s design. The screen itself is now high definition, a big improvement. New are the SeaView bar and SeaWalk high up on deck 16, two glass-bottomed walkways cantilevered out 28 feet over the water. When it comes to cabins the choice is very simple. Either inside (of which there are 342), or outside with a balcony (1,438). There are no plain sea views. The Owners Suites, 12 of them, are all at the stern, and can be best described as comfortable rather than massive. There is nice balcony and separate lounge. Fourteen Penthouses are on offer, with a separate bed area and both categories have the use of a private concierge lounge (which also has a wedding chapel attached). The Mini-Suites are the same width as the standard cabin, but are much longer with the lounge area curtained off, perfect for sleeping children or insomniacs who want to watch films all night. There is a bath and dressing area too. The standard and deluxe staterooms are identical in size, the superior version offering a convertible sofa and various amenity extras. Royal Princess is a new-generation ship for Princess Cruises and will be followed next year by Regal Princess. It will be interesting to see if all the new attention grabbing facilities are retained. In any event first impressions count. From the car park Royal Princess, with its very sleek lines, looked impressive. Princess attracts a different clientele from its sister company P&O. 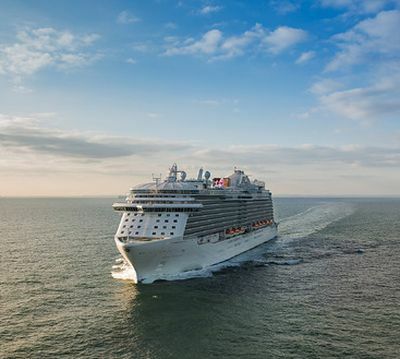 CARNIVAL UK’s two major brands have new leadership following a restructuring by Gerard Tempest, Chief Commercial Officer, who joined the British division of the world’s largest cruise operator six months ago. Tempest was previously Sales and Marketing Director of Whitbread Hotels and Restaurants. Leaving the business is the genial Carol Marlow after 16 years including periods in charge of Swan Hellenic, Princess Cruises UK, Cunard and P&O Cruises. Also departing is Peter Shanks, instrumental in the growth and transformation of Cunard business into the success that it is today, overseeing the launch of Queen Mary 2, Queen Victoria and Queen Elizabeth. As a result of these changes David Dingle formally assumes the titles of CEO Cunard Line and CEO P&O Cruises. HONG KONG’S famous old Kai Tak Airport has reopened as a major cruise terminal, its waterside location and nearness to the Kowloon downtown area ideal for future development. Renowned for its dramatic approaches, with planes swooping in at low altitude above the Hong Kong skyline, Kai Tak Airport served as the city’s main air hub for 73 years, until its closure in 1998. When fully operational next year, the new cruise terminal will be able to berth two large vessels at a time, processing up to 3,000 passengers per hour.